Left to Right Diane Maier, Candace Beckett, Pam Halliwell, Tom Bechert, Bev Eanes and Marge Bechert. As part of the Baltimore Washington “Change the World” Conference, volunteers from the Calvary United Methodist Church participated in community service activities. 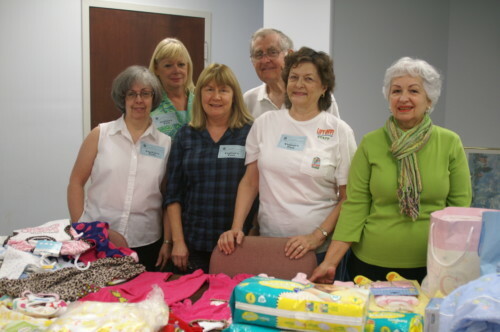 Member of two different women’s groups from the church held baby showers, instead of their monthly meetings, to collect items for Food Link’s Emergency Baby Pantries. Volunteers arrived at the Emergency Baby Pantry on Riva Road, which is one of five pantries in the area, with arms full of new baby clothes, blankets, diapers and baby toys. They spent the morning organizing over $1000 worth of clothing and supplies that were collected at the Baby Showers. Marge Bechert has volunteered with Food Link’s Emergency Baby Pantry since 1995. According to Irenee McElwee, Food Link’s new Emergency Baby Pantry Coordinator, “Calvary was the first church to support the baby pantries. These volunteer efforts will allow all five Emergency Baby Pantries to receive and distribute supplies and clothing to those in need in our community.” Food Link responds to ever-increasing requests from hospitals, caseworkers, churches, individuals and support agencies to meet the urgent needs of babies suffering from poverty, domestic violence, teen pregnancies and unexpected family crises. 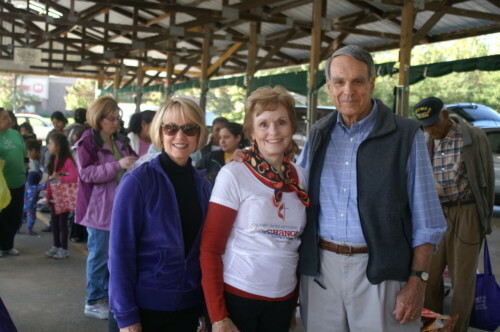 Stephany Clothier, Roberta and Ken Liddick – members of the Calvary United Methodist Church. At the same time the baby pantry items were being delivered, three other volunteers were on hand at the Wholesale Produce on Riva Road, assisting Food Link with the distribution of food and clothing. Food Link distributes fresh fruits and vegetables for free at the Riva Farmers Market each Friday morning to our neighbors in need. The product is donated by the Maryland State Wholesale Market and other produce is provided through Mid-Atlantic Gleaning Network. The program is open every week except holidays, weather permitting. The benefits of healthy eating help against the onset of cancer, diabetes, infectious diseases and a host of other conditions that lock the underprivileged into a cycle of dependency. Food Link, Inc. is the largest hunger relief and food rescue organization in Anne Arundel County and four counties on the Eastern Shore. Food Link’s mission is to alleviate hunger in our community linking vital resources to families and individuals in need. By means of food distribution through a network of over 100 service agencies, Food Link serves emergency shelters, soup kitchens, foster care group homes, treatment and rehabilitation centers, public housing sites and low-income senior citizen facilities. Food Link was established in 1991, as a grassroots, non-profit organization intended to be a safety net for the working poor. Food Link has become the last stop when traditional support fails or turns people in need away. At Food Link, there is no paperwork, no judgment, no rejections and no waiting. Food Link offers immediate help directly to families and individuals or by assisting caseworkers, clergy and community programs. Donated goods and services are the core of our programs and allow us to support over 100 recipient agencies and charitable organizations. Over the years, Food Link has become the first stop for help in the midst of a crisis and the last stop for help when traditional support programs are unable to help. We offer an immediate response to human needs, while others may take weeks, even months to process requests for aid. Over 40,000 people in our community live below the poverty level, 50% of them are children. Thousands of Anne Arundel County residents must choose between paying rent and buying food. It’s a choice that no one should have to make. For more information, please contact Cathy Holstrom, Executive Director of Food Link 410.693.5443.